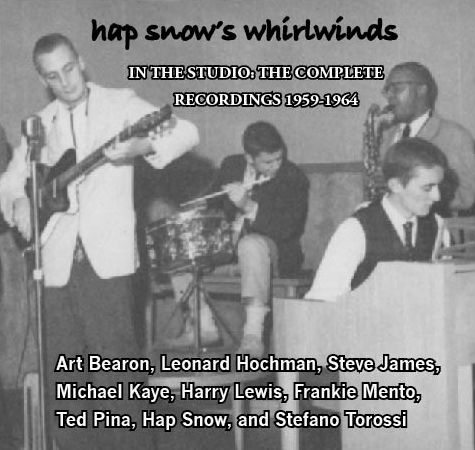 Between 1959 and 1964, Hap Snow’s Whirlwinds recorded five tracks in the studio: “Banshee,” “Bottom’s Up,” “Let’s Have a Party,” and “Len’s Hassle” were cut at Ace Recording Studios in Boston, Massachusetts in 1959 and 1960, while “Back Again” was recorded at WNEU Studio at Northeastern University in Boston in 1964, produced by Ron Frizzell. The first track, “Banshee,” is an instrumental written by James K. “Hap” Snow, Art Bearon, and Stefano Torossi. Like “Bottoms Up,” written by D’Angelo and Bearon, it features Bearon on piano, Harry Lewis on saxophone, James K. “Hap” Snow on lead guitar, and Stefano Torossi on drums. “Let’s Have a Party,” the third song was written by Snow and features Bearon on piano, Leonard Hochman (Len Arnold) on sax, and Snow on lead guitar and lead vocals. “Len’s Hassle,” the fourth song, features the same players on an instrumental. “Back Again,” the final track written by Steve Fradkin features Frank Chiumento (Frankie Mento) on drums, Steve Fradkin (Steve James) on rhythm guitar and lead vocals, Michael Kaye on keyboards and vocals, Ted Pina on bass guitar, and Snow on lead guitar and vocals. 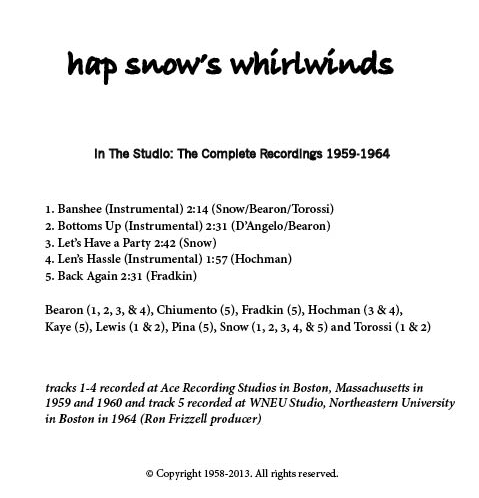 In addition to this EP, several new downloadable albums are now available on this site including Hap Snow’s Whirlwinds – Banshee [Single] (1959), Class featuring James K. Snow – “Think Back” [Single] (1975), and Class featuring James K. Snow – “Jesse James” [Single] (1975). FLAC versions are available upon request. Stay tuned for more downloads in the near future. This entry was posted in Unreleased Music and tagged "Back Again", "Banshee", "Bottoms Up", "Len's Hassle", "Let's Have A Party", Ace Recording Studios, Art Bearon, Arthur Bearon, Boston Rock, Frank Chiumento, Frankie Mento, Hap Snow, Hap Snow's Whirlwinds, Harry Lewis, James K. Snow, Len Arnold, Leonard Hochman, Massachusetts Rock, Michael Kaye, New England Rock, Northeastern University, Ron Frizzell, Stefano Torossi, Steve Fradkin, Ted Pina, Williams College, WNEU. Bookmark the permalink. Glad you enjoyed it. I love the power of the Internet to share this music with a larger audience. More rock and roll is enroute, stay tuned.